[S682] Image of the 1891 Census for Kedington, Suffolk: RG12 Piece 1436 Folio 53 Page 17. [S2487] Image of the 1881 Census for Kedington Village, Suffolk: RG11 Piece 1822 Folio 57 Page 31-32. [S423] Transcript of the Burial Registers of Kedington, Suffolk, compiled by Edwin Prockter. "01.09.1899 John PASK, age 49 [think this should be 01.09.1890]." [S136] Letter from Edwin Prockter to Stuart Pask dated 15 April 2004: "Churchyard Inscriptions on Microfilm - 68. Edna PASK, died 1.7.1921,aged 74." [S460] 1891 Census for Kedington, Suffolk. Full details upon request: PRO Ref RG12 Piece 1436 Folio 53 Page 17. [S422] Transcript of the Marriage Registers of Kedington, Suffolk, compiled by Edwin Prockter. "23.08.1879 Elijah PASK 23 to Olga BASHAM 21. Fathers: George PASK & John BASHAM - Labourers." [S514] Image of the 1881 Census for Kedington, Suffolk: RG11 Piece 1822 Folio 57 Page 32. [S3] GRO Indexes to Marriages. "1879/Q3 PASK, Elijah = BASHAM, Olga Risbridge 4a 625." [S4355] Transcript of the marriage of Elijah Pask and Olga Basham, 23 August 1879. Kindly provided by Sandra Stevens - GOONS Marriage Challenge. [S2488] Image of the 1891 Census for High Street, Balsham, Cambridgeshire: RG12 Piece 1291 Folio 17 Page 5. [S2489] Image of the 1901 Census for Old House Road, Balsham, Cambridgeshire: RG13 Piece 1536 Folio 17 Page 1-2. [S3391] Image of the 1911 Census for High Street, Balsham, Cambridgeshire: RG14 Piece 9155 Schedule 5. [S4] GRO Indexes to Deaths. "1918/Q1 PASK, Olga Linton 3b 594 age 66." [S421] Transcript of the Baptism Registers of Kedington, Suffolk, compiled by Edwin Prockter. "14.05.1882 John to Elijah & Olga? PASKE." [S6] Teresa & Stuart Pask's Guesses, Theories and Speculations: Based on date & location. [S2] GRO Indexes to Births. "GRO Online Index: 1893/Q1 PASK, David BASHAN Linton 3b 492." [S2] GRO Indexes to Births. "1858/Q1 PASK, John Risbridge 4a 379." [S3] GRO Indexes to Marriages. "1880/Q2 PASK, John Rochdale 8c 87." [S417] Website Ancestry Civil Registration - Marriages: "1880/Q2 PASK, John Rochdale 8c 87 = CAIN, Ellen." [S2415] Website Lancashire Births Marriages & Deaths (http://www.lancashirebmd.org.uk) : PASK John CAIN Ellen Rochdale Register Office or Registrar Attended Rochdale RM/59/7. [S4] GRO Indexes to Deaths. "1930/Q3 PASK, Ellen Rochdale 8e 49 age 75." [S4] GRO Indexes to Deaths. "1936/Q1 PASK, John Rochdale 8e 63 age 77." [S421] Transcript of the Baptism Registers of Kedington, Suffolk, compiled by Edwin Prockter. "13.11.1881 Kate to Elijah & Ellen PASKE." [S3] GRO Indexes to Marriages. "1880/Q4 PASK, Elijah Risbridge 4a 920." [S3] GRO Indexes to Marriages. "1880/Q4 CLARK, Ellen Risbridge 4a 920." [S2816] Image of the 1891 Census for Snailwell, Cambridgeshire: RG12 Piece 1293 Folio 116 Page 10. Indexed incorrectly under the name of PARK. [S2817] Image of the 1901 Census for 83 Crostons Road, Elton, Lancashire: RG13 Piece 3637 Folio 5 Page 2. [S4] GRO Indexes to Deaths. "1907/Q4 PASK, Ellen Bury 8c 330 age 46." [S4279] Image of the 1911 Census for 2 Parson Street, Elton, Bury, Lancashire: RG14 Piece 23463 Schedule 269. [S3] GRO Indexes to Marriages. "1915/Q4 HEAP, Ethel PASK Bury 8c 1133." [S4] GRO Indexes to Deaths. "1926/Q3 PASK, Elijah Bury 8c 447 age 67." [S421] Transcript of the Baptism Registers of Kedington, Suffolk, compiled by Edwin Prockter. "06.10.1886 Frank to Elijah & Ellen PASKE." [S2] GRO Indexes to Births. "1919/Q3 PASK, Frederick HEAP Bury 8c 811." [S2] GRO Indexes to Births. "1922/Q3 PASK, Rose HEAP Bury St E 8c 888." [S2] GRO Indexes to Births. "1924/Q1 PASK, Ella HEAP Bury 8c 856." [S2] GRO Indexes to Births. "1864/Q3 PASK, Martha Risbridge 4a 374." [S4] GRO Indexes to Deaths. "1955/Q1 PASK, Martha Bury 10b 1008 age 90." [S3331] E-mail from Alison Highet to Stuart & Teresa Pask dated 7 October 2008. [S460] 1891 Census for Kedington, Suffolk. Full details upon request: PRO Ref RG12 Piece 1436 Folio 48 Page 8. [S422] Transcript of the Marriage Registers of Kedington, Suffolk, compiled by Edwin Prockter. "13.05.1893 Thomas PASK 28 to Ruth RUSE 28. Fathers:William PASK & William RUSE - Labourers." [S697] Image of the 1901 Census for Kedington, Suffolk: RG13 Piece 1737 Folio 54 Page 8. Indexed incorrectly under the name of PARK. [S3] GRO Indexes to Marriages. "1893/Q2 PASK, Thomas = RUSE, Ruth Risbridge 4a 947." [S4361] Transcript of the marriage of Thomas Pask and Ruth Ruse, 13 May 1893. Kindly provided by Sandra Stevens - GOONS Marriage Challenge. [S4] GRO Indexes to Deaths. "1898/Q3 Risbridge 4a 482 age 33." [S423] Transcript of the Burial Registers of Kedington, Suffolk, compiled by Edwin Prockter. "29.08.1898 Thomas PASK, age 33." [S2] GRO Indexes to Births. "1879/Q2 PASK, Ethel Risbridge 4a 513." [S4366] Transcript of the marriage of William Nunn and Ethel Pask, 16 December 1899. Kindly provided by Sandra Stevens - GOONS Marriage Challenge. [S421] Transcript of the Baptism Registers of Kedington, Suffolk, compiled by Edwin Prockter. "08.06.1879 Ethel to John & Edney? PASKE." [S422] Transcript of the Marriage Registers of Kedington, Suffolk, compiled by Edwin Prockter. "16.12.1899 William NUNN 22 to Ethel PASK 21. Fathers:----& John PASK Labourers. Wits: Henry & Jane TALBOT." [S3] GRO Indexes to Marriages. "1899/Q4 PASK, Ethel = NUNN, William Risbridge 4a 1485." [S4] GRO Indexes to Deaths. "PASK, David George 1 Mar 1917 Merthyr Tydfil 1993 March District 8602 Reg 75 Ent 98." [S2947] Baptisms, St. Martins Church, Caerphilly. Provided by Pat Maybrey: "17/4/1917 David George s/o James Thomas Pask (Haulier) & Jane of 33 Van Rd." [S4] GRO Indexes to Deaths. "PASK, DAVID GEORGE 1 March 1917 MERTHYR TYD 1993 March Reg No 75 Ent No 098 Dor 393." [S2] GRO Indexes to Births. "1917/Q2 PASK, David G. PONTING Pontypridd 11a 894." [S3] GRO Indexes to Marriages. "1947/Q1 PASK, David G. = BISHOP, Alfreda Weston 7c 657." [S4] GRO Indexes to Deaths. "1972/Q4 PASK, Alfreda 8 JE 1917 E Glamorgan 8b 1591." [S461] E-mail from Anna Pask to Stuart & Teresa Pask dated 18 August 2004. [S470] E-mail from Lyn Pask to Stuart & Teresa Pask dated 23 August 2004. [S4999] Website UK Government Probate Search Service: PASK David William Sydney of 52 Brynau Road Castle Pask Caerphilly Glamorgan died 30 March 1967 at Velindre Hospital Whitchurch Glamorgan Administration Llandaff 26 July to Margaret Rose Pask widow. £7469. [S4] GRO Indexes to Deaths. "1967/Q1 PASK David W.S. age 31 W. Glamorgan 8b 323 (Text very faint)." [S2] GRO Indexes to Births. "1935/Q4 PASK, David W.S. BRAY Bedwellty 11a 145." [S461] E-mail from Anna Pask to Stuart & Teresa Pask. [S3] GRO Indexes to Marriages. "1959/Q4 PASK, David W. S. = BROOKES, Margaret R. Bedwelty 8c 75." [S2] GRO Indexes to Births. "1960/Q2 PASK, Margaret BROOKS Bedwellty 8c 68." [S1599] E-mail from Nicholas William Pask to Stuart & Teresa Pask dated 11 October 2005. [S3777] E-mail from Simon Robert Pask Williams to Stuart & Teresa Pask dated 19 July 2010. In the census of 5 April 1891 in 101 Newland Street West, Lincoln, Lincolnshire, she was listed as the wife of Jabez BENNETT (a Dairyman living with his wife, three sons and a grand-daughter Elizabeth AELBERRY. Also living with them was Annie CURTIS, a domestic servant from Southrey. [S462] E-mail from Philip Alderson to Stuart & Teresa Pask dated 15 August 2004. [S384] Website FamilySearch Internet (http://www.familysearch.org) : Batch Number: C030811. [S1971] Image of the 1851 for Stainton by Langworth, Lincolnshire: HO107 Piece 2106 Folio 69 Page 1. [S907] Image of the 1841 Census for Scothern, Lincolnshire: HO107 Piece 643 Book 17 Folio 13-14 from Archive CD Books. [S3] GRO Indexes to Marriages. "1859/Q4 PASK, Jane Lincoln 7a 981." [S1972] Image of the 1861 Census for St. Mary le Wigford, Lincolnshire: RG9 Piece 2358 Folio 18 Page 29. [S1977] Image of the 1871 Census for St Mary le Wigford, Lincolnshire: RG10 Piece 3371 Folio 26 Page 45. [S466] Image of the 1881 Census for 101 Newld Street West, Lincoln, Lincolnshire: RG11 Piece 3240 Folio 113 Page 76. [S465] Image of the 1891 Census for Lincoln, Lincolnshire: RG12 Piece 2591 Folio 103 Page 59. [S467] Image of the 1901 Census for Lincoln, Lincolnshire: RG13 Piece 3062 Folio 15 Page 21. Indexed incorrectly under the name of BURNETT. [S462] E-mail from Philip Alderson to Stuart & Teresa Pask dated 15 August 2004 - Photograph of Monumental Inscription for Jane and Jabez. [S4999] Website UK Government Probate Search Service: 1904: BENNETT Jabez of 101 Newland-street-west Lincoln diaryman died 1 September 1904 Probate Lincoln 22 October to Jane Bennett widow and George Thomas Bennett and William Parnham Bennett dairymen Effects £925 7s. 3d. [S4999] Website UK Government Probate Search Service: 1909: BENNETT Jane of 101 Newland-street West Lincoln widow died 13 January 1909 Probate Lincoln 1 February 1909 to George Thomas Bennett and William Parnham Bennett dairymen. Effects £12 10s. 10d. Children of Thomas PASK and Alice PASKE née ? Bp 17790912 Thomas Pask at Hackthorn, son of Joane & Anne Pask. [S4] GRO Indexes to Deaths. "1858/Q2 PASK, Thomas Lincoln 7a 305." [S27] Website National Burial Index (NBI) @ FindMyPast (www.findmypast.co.uk: ) 18 Jun 1858 Thomas PASK 81 Lincolnshire Stainton by Langworth, St John the Baptist. Bp 17790912 Thomas Pask at Hackthorn, son of John & Anne Pask. [S6] Teresa & Stuart Pask's Guesses, Theories and Speculations: Based on ages of children. [S6] Teresa & Stuart Pask's Guesses, Theories and Speculations: Assumption based on the fact they were born in the same place. [S27] Website National Burial Index (NBI) @ FindMyPast (www.findmypast.co.uk: ) 20 Nov 1859 Alice PASK 77 Lincolnshire Stainton by Langworth, St John the Baptist. [S4] GRO Indexes to Deaths. "1859/Q4 PASK, Alice Lincoln 7a 319." In the census of 5 April 1891 in 101 Newland Street West, Lincoln, Lincolnshire, Jabez was listed as the Head of Household; a Dairyman living with his wife, three sons and a grand-daughter Elizabeth AELBERRY. Also living with them was Annie CURTIS, a domestic servant from Southrey. [S1973] Image of the 1861 Census for Minting, Lincolnshire: RG9 Piece 2365 Folio 31 Page 3. [S27] Website National Burial Index (NBI) @ FindMyPast (www.findmypast.co.uk: ) 17 Jan 1836 William PASK 30 Lincolnshire Scothern, St Germain. [S810] E-mail from Sally Baldwin to Stuart & Teresa Pask dated 13 June 2005. [S810] E-mail from Sally Baldwin to Stuart & Teresa Pask dated 20 November 2004 - gives year of birth c1806. [S810] E-mail from Sally Baldwin to Stuart & Teresa Pask dated 20 November 2004. [S1289] Image of the 1861 Census for Welton, Lincolnshire: RG9 Piece 2364 Folio 143 Page 26. [S416] Website Ancestry Civil Registration - Deaths: 1871/Q4 BALDWIN, Mary Lincoln 7a 321 age 61. [S6] Teresa & Stuart Pask's Guesses, Theories and Speculations: Based on location and year of birth from 1861 census. [S6] Teresa & Stuart Pask's Guesses, Theories and Speculations: Based on the 1841 census - her children had the surname of COOT. [S463] Image of the 1891 Census for Stainton, Lincolnshire: RG12 Piece 2596 Folio 182 Page 1. [S3] GRO Indexes to Marriages. "1850/Q2 PASK, Thomas Lincoln 14 8?3." [S2027] Will of Thomas Pask. [S3457] Transcript of the marriage of Thomas Pask and Charlotte Knowles, 5 June 1850. Kindly provided by Mick Hopkins - GOONS Marriage Challenge. 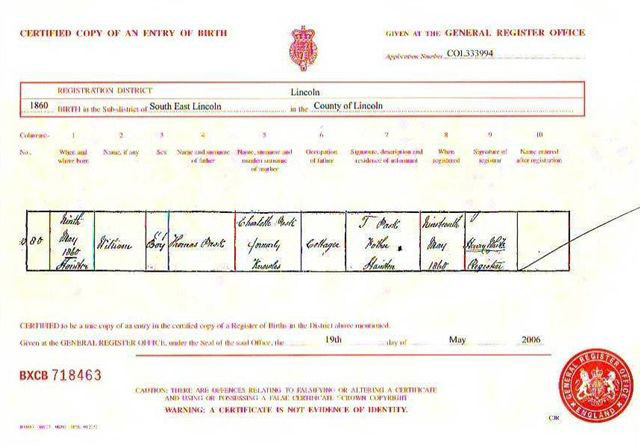 [S2141] Copy of the birth certificate of William Pask, born 9 May 1860. Kindly provided by Chris Bell. [S905] Image of the 1871 Census for Stainton, Lincolnshire: RG10 Piece 3377 Folio 72 Page 8. [S2] GRO Indexes to Births. "1860/Q2 PASK, William Lincoln 7a 473." [S1968] Image of the 1861 Census for Stainton, Lincolnshire: RG9 Piece 2364 Folio 126 Page 5. [S464] Image of the 1881 Census for Stainton, Lincolnshire: RG11 Piece 3246 Folio 97 Page 1. [S4] GRO Indexes to Deaths. "1893/Q2 PASK, Thomas Lincoln 7a 325 age 73." [S4999] Website UK Government Probate Search Service: 1893: PASK Thomas of Stainton-by-Langworth Lincolnshire farmer died 5 April 1893 Probate Lincoln 17 October to Maltby Davy and Thomas Bateman farmers Effects £100 19s 4½d. [S27] Website National Burial Index (NBI) @ FindMyPast (www.findmypast.co.uk: ) 8 Apr 1893 Thomas PASK 73 Lincolnshire Stainton by Langworth, St John the Baptist.